We lived in a small, narrow street. 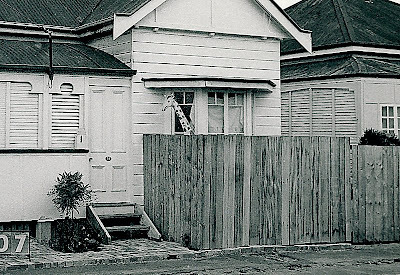 In Brisbane terms it was barely narrow enough to be a lane, and even more unusually houses were built almost to the street frontage itself. 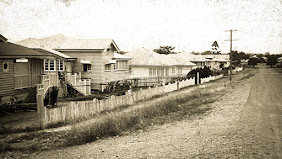 Our house had begun to look almost respectable we thought, if not fashionably trendy, with its high timber fence we'd built from a packing case stolen scrounged from the glass factory at the end of the street, and pavers similarly appropriated from the gasworks at South Brisbane. After a hectic bout of incessant renovation, we motored off into the sunset for a tiny and well deserved dose of R&R, expecting that on our return, all our good works would hit us in the face and we'd bask in a fresh glow of self satisfaction. After a week or two under blue skies and lying on golden sands, our neighbourhood did seem a little duller than we remembered it, and we did think it unusual, as we turned into our street, to note that the sign that had once read "Cambridge Street", now quite clearly, in jagged black letters declared that we were heading into "Darkest Africa". Should we, in that light of that, have been surprised to find a Giraffe peering over our fence? Where does any giraffe come from?